Steven Gullotta Electronics, IDM Following on his very successful album "NODAL POINT GANG", Philadelphia, Pennsylvania based cyberpunk low.poly.exception has released a successor to the album titled "MEGASTRUCTURE(S)". While the previous album followed a group of elite hackers keeping information free, this one takes a darker turn in a lifeless direction. What if, in the future, these giant structures that have been erected were now suddenly devoid of life minus the machines that roamed within? "MEGASTRUCTURE(S)" wants to tell that story. Just as with his previous album, low.poly.exception continues craft a unique blend of cyberpunk aesthetics, crawling cinematic scores, and softer industrial tones throughout the album. This tasty milkshake that low.poly.exception becomes so sweet with songs such as 'Within/Without' wherein a slow crawling rhythm is offset by several other electronic oddities, from sci-fi synths to small segments of electronic tings. There is also a slight divide in the album where the slower, more cinematic songs meet the more rambunctious and powerful tracks. The first three songs are your cinematic ones; the songs you can sit back to and imagine a huge, sprawling dead city still living thanks to the machines within. The divide comes in with 'POISON.sys" wherein, with much thanks to the guitars rendered from Die Scum Inc., gets slightly heavier. After that there's a full blown effort to make menacing cyberpunk beats with 'The Deleted Shall Inherit the Earth', 'Erase and Replicate', and 'Godmode'. The final song on the album does bring the song back in full circle as it is more calming and soothing than most songs on the album. "MEGASTRUCTURE(S)" shows low.poly.exception's continued mastering of both himself and the electronic music he presents to the world. Since following him from his roots in Neon Shudder to this brand new project, low.poly.exception has me fascinated with how far he's come in such a short amount of time. The album is currently available over on Bandcamp under the pay-what-you-want model, so go get it. 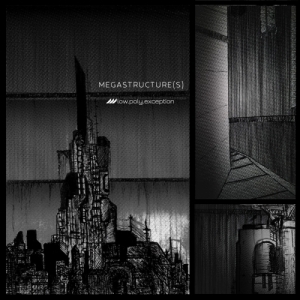 Following on his very successful album "NODAL POINT GANG", Philadelphia, Pennsylvania based cyberpunk low.poly.exception has released a successor to the album titled "MEGASTRUCTURE(S)". While the previous album followed a group of elite hackers keeping information free, this one takes a darker turn in a lifeless direction. What if, in the future, these giant structures that have been erected were now suddenly devoid of life minus the machines that roamed within? "MEGASTRUCTURE(S)" wants to tell that story. Russian Industrial Metal Outfit Gottwut Releases Debut Album "Konglomerat"